The Husqvarna 455 Rancher is ideal for homeowners and landowners looking for a durable, powerful chainsaw. This model is built to withstand any cutting condition and comes with the added bonus of being lightweight and ergonomically designed. No matter whether you’ve never used a chainsaw before or have decades of experience, this machine is easy to operate and maintain. Let’s take a closer look at this model’s specs and see how it compares to the competition. 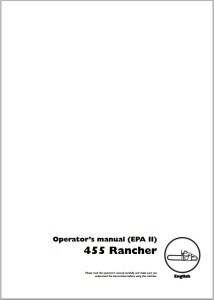 Click on the image to open operators manual for this model in new window! Much like the other models offered by Husqvarna, this version features a low vibration system that helps reduce user fatigue. This system and the light weight of the saw make it easy to use for extended periods of time. What is more, its X-Torq feature helps reduce fuel consumption while also helping to reduce emission exhaust. As a result, this machine is easier on the environment and you save on fuel costs. In fact, the X-Torq feature alone reduces consumption by up to 20 percent. The saw uses a 3-piece crankshaft, which makes it extra durable – even when faced with a tough job. What is more, a front ergonomic handle allows for an improved grip and further helps reduce fatigue. The chain tensioner is located on the side of this machine for easy access. Additionally, this model has a quick-release air filter makes it easy to clean and replace air filters when necessary. An adjustable oil pump allows you to control the flow of the oil depending on the job and the weather. Felling marks allow for improved precision felling. Keep in mind: The chain brake is activated by inertia, reducing the risk of injury because of kickback. 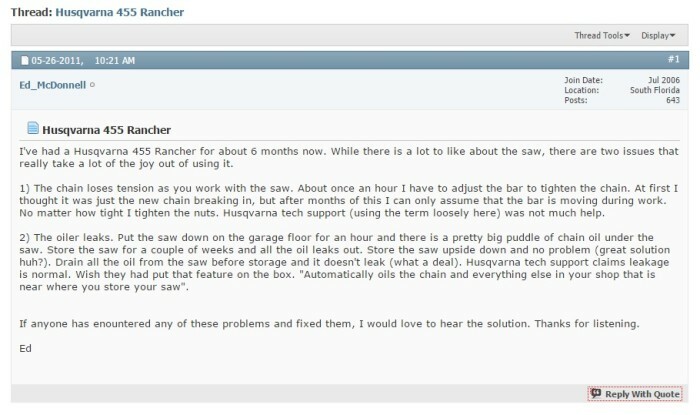 Anyone that has ever used a chainsaw understands first-hand just how frustrating start-up can be. The saw features a combined choke/stop control, which allows you to easily start it up without flooding the engine. When warmed up, this machine can start up in as little as one or two pulls. The air purge feature also helps remove air from the fuel system and the carburetor to make start-up easy. These two features are backed by Husqvarna’s Smart Start feature, which is designed to make start-up as simple and quick as possible. 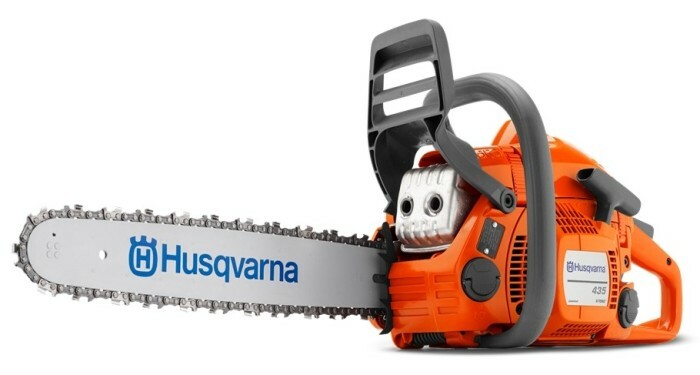 Much like other saws offered by Husqvana, the 455 model features a centrifugal air cleaning system that eliminates larger dust particles before it reaches the air filter. This reduces the strain on the filter, which results in fewer cleanings and an extended engine life. It’s easy to see why this model is a best-selling chainsaw, but it’s not without its flaws. Let’s take a look at the pros and cons of this model. The chain brake is sensitive. Easy access to chain tensioner. 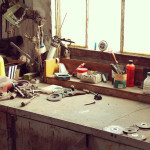 Lean settings may cook the engine. Keep in mind: You warranty can be extended to 4 years if you purchase 3, 32-ounce cans of fuel and register your product online. As you can see,these include two main categories, chains and laminated bars. But you will be able to purchase even transportation boxes and bags. Weight – It’s lightweight, powerful and cuts even the toughest trees like butter. Most note that the saw is so light, weight only becomes an issue when cutting above shoulder height. The reduced vibration also makes it a pleasure to use this machine. 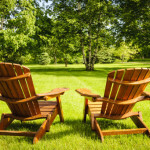 Performance – As far as performance is concerned, this product can handle just about any type of tree, including large oaks. It starts after just a few pulls and can easily cut down trees that are 35”+ in diameter. We love the way this saw handles and how easily it cuts through just about anything. It’s a fantastic product for homeowners and almost as good as a professional model. Click on the image above to see the whole discussion on this product! Loudness – For starters, it can be loud. This is to be expected with any brand, but this model is particularly loud. Possibility of cooking your engine – Another issue, which tends to be a problem for many chainsaws, is the low/hi mixture settings. Because of EPA regulations, the settings are lean. If the machine is not broken in properly, you may wind up cooking your engine. If you remove this control system, you void your warranty. Some users suggest removing the control system anyway if you plan on using the saw frequently, but we cannot recommend this as it completely voids its warranty. Not for professionals – Another important thing to point out is that this version is designed for homeowners – not professional use. If you purchase this product with the intention of using it professionally, it may not live up to your expectations! Keep in mind: There is no doubt that this version is one of the best on the market for homeowners, but how does it compare to the competition? 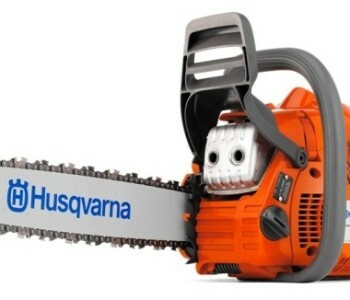 Stihl is Husqvarna’s biggest competitor, and the brand has a reputation for producing some of the best saws on the market. Does the 455 Rancher beat out Stihl homeowner models in performance and price? While the 455 may beat out the 251 as far as performance is concerned, the two are comparable when it comes to quality. Both chainsaws are reliable, durable and powerful. They’re also comparable in the price department. 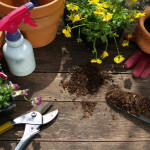 Echo is another competitor, but it focuses on the professional sector rather than the homeowner. They have several different saws in their lineup, but the only model that’s comparable as far as price and performance are concerned is the CS-550P (learn more about this model here). Much like the 455 Rancher, this model also features a side-mounted chain tensioner, and the two saws are comparable in weight. 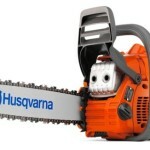 Both models are great, but the Husqvarna wins out in the price department. The CS-550P retails between $499 and $519. The Husqvarna 455 Rancher is the perfect version for homeowners. 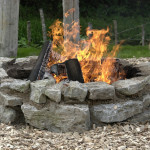 No matter whether you’re using it to chop firewood or clean up after a storm, this model can handle just about anything you throw at it. 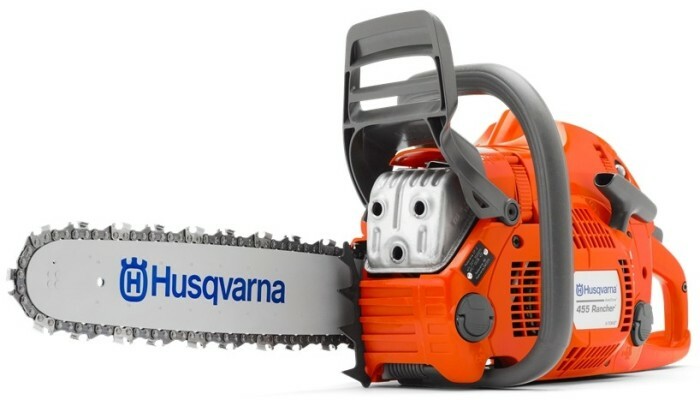 For just $399, this is an affordable chainsaw that should be in every homeowner’s garage!